The guideline manual is a major tool for the transfer of knowledge and experience using mentoring as a measure to promote women in academia and research. It is based upon a comparison between four existing mentoring programmes at universities in Austria, Germany, and Switzerland. 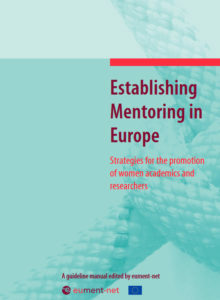 The manual also provides a basis for transferring expert knowledge on mentoring to countries where there is as yet no mentoring scheme, as demonstrated in the example of Bulgaria. It provides examples of best practice in how to design, implement, and prepare the ground for mentoring programmes under specific conditions at local, regional, and national levels. This publication is based on the eument-net workshop on “Mentor training and coaching” held in 2010. 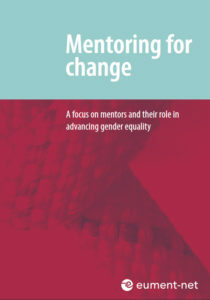 Contributions provide insight how mentoring programmes can enhance their effectiveness in empowering the individual mentee while also fostering organisational change through an increased focus on mentors. They show how academic mentoring programmes conceive a mentor’s role and how the understanding of this role can be increased and developed. Contributions also discuss experiences with different kinds of training for mentors.